Lazies, I just returned from Quilt Market in Houston and one of my most popular demo’s was showing how to do a double miter. Actually, it’s a double fold, double miter. The big boy of mitering. I must say, I’ve never been fabulous enough to pull this off nicely, so I mostly just avoid it whenever possible…until now. It’s a perfect edge finish for a napkin, placemat, table runner and more. 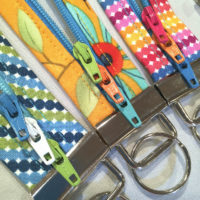 Beth Bradley, Senior Editor of Sew New Magazine, posted this clip of my demo on the Sew New Facebook page. Beth’s clip went viral with more than 300,000 views!!! This is me demonstrating my Hot Hemmer from Clover Needlecraft’s Press Perfect line. The demo starts just after I use the Hot Hemmer to measure/fold/press 2″ on each side at the corner. Turn your volume on so you can hear me. 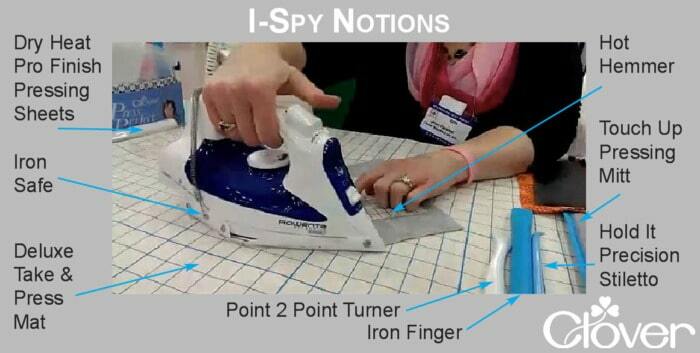 This is me demonstrating my Hot Hemmer from my Press Perfect line here by Sew News. 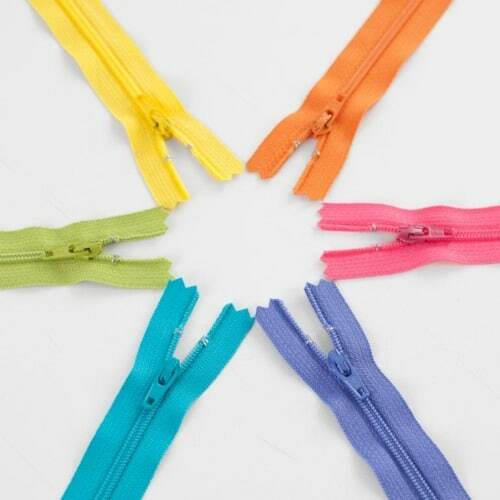 You can ‘Like’ Sew News on Facebook here. Mitering is just one of the things you can do with the Hot Hemmer. Let’s take a closer look at the features of this handy tool. Here’s another video demo showcasing all of these features: Hot Hemmer. Why The Hot Hemmer is Fabulous? 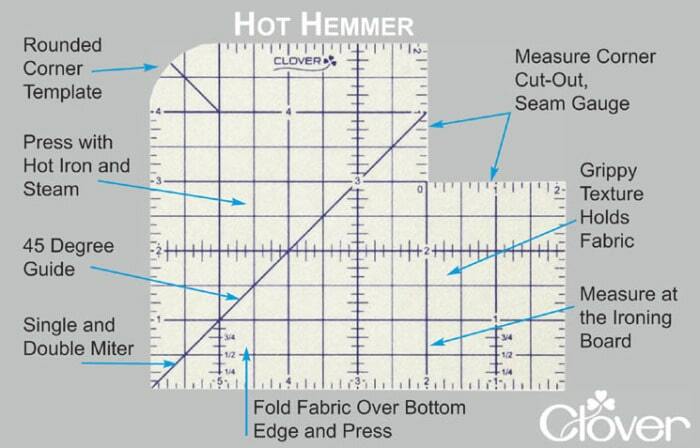 There’s a reason why the Hot Hemmer has been recommended/featured in several sewing/quilting magazines. It’s a thin nylon fiber board with an accurate ruler. 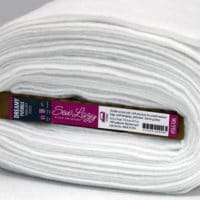 You can press on it with a hot iron and steam, and it has a grippy texture that holds your fabric. It’s a helping hand at the iron for a multitude of tasks. 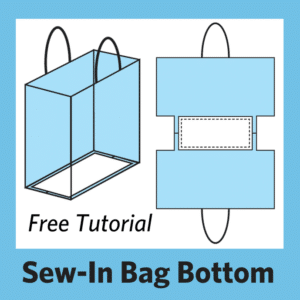 Quite simply, it’s a basic we should have had when we started sewing. I’ve had a number of questions about the rest of the notions you can see in the video. Here’s a breakdown of the goodies. Everything listed is in my Press Perfect line from Clover. 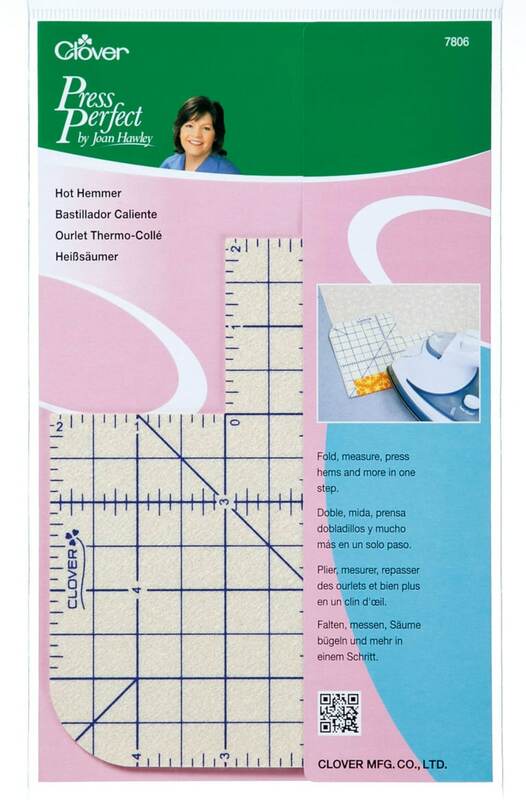 The Hot Hemmer (item 7806) from Clover is available and in stock at local quilt shops, online for the whole Press Perfect line. 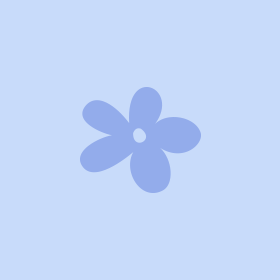 Read product reviews for the Hot Hemmer at Amazon here. Are You A Hot Hemmer Fan? Post a comment and tell me what you think, how you use the Hot Hemmer now, or plan to use it when you get one. I saw this on Facebook and would love to have one! BTW…another blogger I follow, It’s Sew Anny, was also at that quilt market in Houston – with a very glowing account of the whole experience. 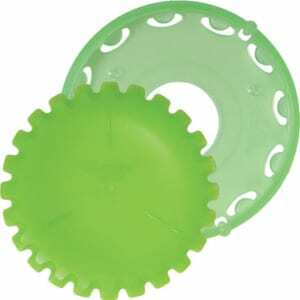 I would use it to measure up a hem for pants as well we do the mitered corner when doing rug mugs that need that mitered edge. 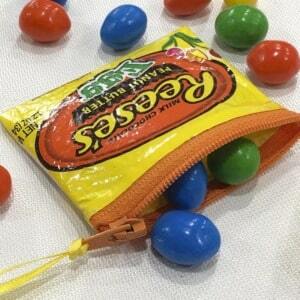 Looks like a wonderful tool for my sewing room. 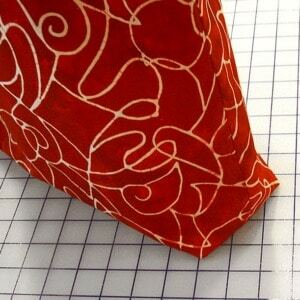 I would use it for quilts, table runners, table toppers and placemats. I have one and I love it!!! I bought it when Nancy’s Notions first came out with it. 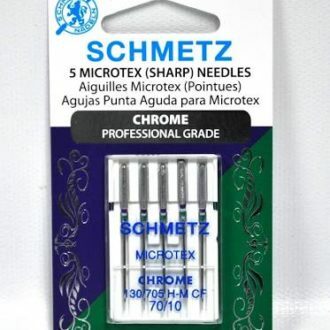 I have used it for my table runners, placemats, quilts, regular hemming projects. Love it, Love it! 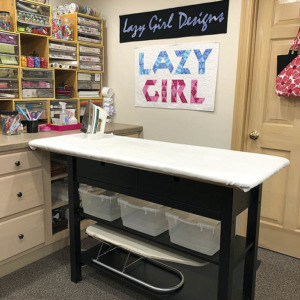 It is a must in your sewing room!